In 1593, Christopher Marlowe penned Edward II, based on the life of Britain’s only openly gay monarch. 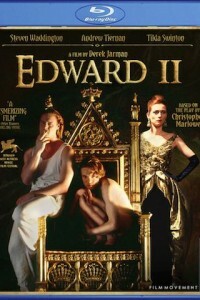 In 1991, legendary artist and director, Derek Jarman (Wittgenstein, Caravaggio) radically adapted the Elizabethan drama in a highly stylized feature starring Jarman muse and Oscar-winner Tilda Swinton and Steven Waddington. Jarman’s postmodern adaptation delivers filmgoers to the court of Plantagenet King Edward II (Waddington), a weak gay monarch with a tenuous grasp on the throne. The stage is set for palace revolt when the King rejects his wife, Queen Isabella (Swinton), and takes a male lover, the ambitious commoner Piers Gaveston (Andrew Tiernan) upon whom he bestows gifts and power. The spurned Queen and the sober court officials become enraged and the plotting begins in this festival favorite, a Golden Lion nominee at Venice, called “intelligent and striking,” and a “phantasmagoric, outrageously stylized interpretation”. With anachronistic imagery, gay activists battling riot police and a rare film appearance by Annie Lennox singing Cole Porter’s 1944 classic “Ev’ry Time We Say Goodbye,” the story of Edward and the persecution he suffered is given contemporary resonance in one of Jarman’s most powerful and personal films.